Ok so here's my plea. I need help finding Medical care for a 13 year old girl in Haiti. I have posted about her several times here on my blog. Her name is Nadine. I won't repeat what I have already written. Click here to read previous blog post. I met Nadine 3 years ago in Peredo. During that time I have tried and tried to get her the help she needs in Haiti. I was unsuccessful getting her a CT scan until now. Now that she has a diagnosis, help is with in reach. Nadine had a CT scan on the USS Comfort Ship. The CT showed 8-10 large cysts in her abdomen. We have copies of the CT scan avaliable for doctors who want to consider her case. 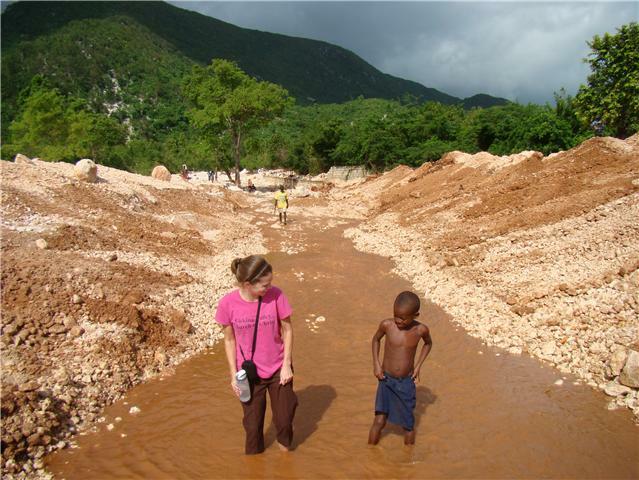 Often times people tell me how "cool" my job is...helping people in Haiti...living in Haiti. And most days, it is cool. But this is the part that's out of my hands. There is a lady in the states who looks for medical care for the kids Angel Missions is helping. To be elegible for a medical visa in our program, the doctor and hospital have to donate the entire cost of services, materials and hospital stays. 100%. We have to have letters to take to the American Embassy which state all care is free of charge and n medicare/medicaid funds will be used. This is where you can help. I am Nadine's advocate in Haiti but you can be her advocate in the states. (You would not do any work on this other than the referral. Angel Missions takes care of all paperwork after contact is made) I am really talking to my Nationwide Children's Hospital friends in Ohio. Hint hint. I worked at this hospital for a few years and the general surgery department is amazing. I have seen them help so many children and I believe Nadine is another. Please please please (this is not just geared toward Nationwide Children's Hospital) talk to a surgeon about her-show her pictures, give them the results of the CT. A copy of the actual CT is avaliable. If you know someone who works in a Pediatric Hospital-whatever their job-ask them to check it out for you. Email me at ginnyandrews@hotmail.com. And most importantly pray-God can open doors we didn't even know existed. Two doctors and a NP in Ohio have agreed to care for Nadine for free! They are putting together a presentation for the hospital to ask them to accept her free of charge. Join us in praying for a positive decision! Thanks to everyone who wrote and asked doctor's and hospitals in their area. I was so surprised at the responses to help Nadine! Ginny, I do not personally know you; however, I know the devastation of Haiti. I, myself, went there over 7 years ago, and I am sure it is only worse. My point, your unselfish sacrifice to serve others, is amazing. I feel led to post a link to this blog posting daily on facebook. Not because I think I will make a difference, but I KNOW our God is strong enough! I have to admit this past year, when my husband went to Haiti, I was selfishly upset, thinking ... why are you going you have a young family, but... when life hits you in the face, and you allow God in your realize, it is NOT about what I as a person want, but what God desires. And when I allow HIM to work, amazing things happen. So thank you for your sacrifice. I feel led to share a link of the young lady's needs on my blog. Which I will be doing as soon as I send this. I pray and believe many blessings are about to explode for the mission God has called you to do!